I spent the last few days catching up on my One Little Word prompts for 2017. This is one of the projects I vowed that I would finish this year, even if I was doing the prompts a bit late. For the month of September, the prompt asked us to look at our word as it relates to the words Rest ~ Pace ~ Joy. Are we finding time for those things and are we managing them? The cards for this month were a digital download from the class & I filled in the text using Photoshop Elements and I added the stamped words from this year's OLW stamp set. 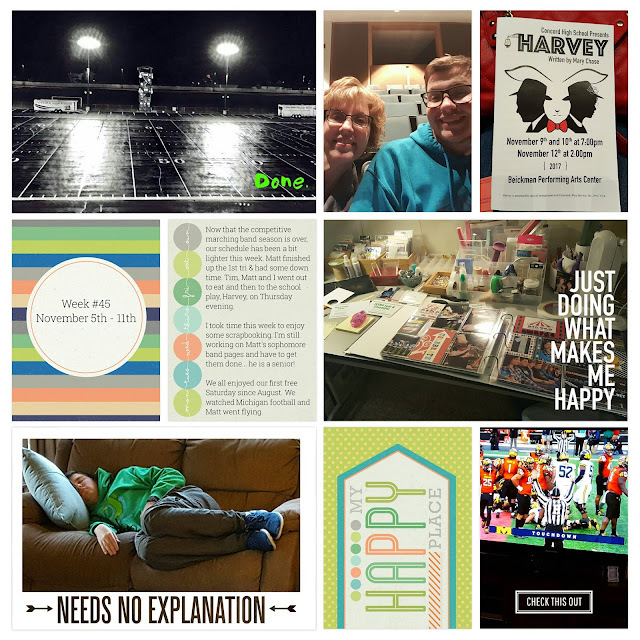 Below are a few photos from this month that described what was happening in my life, a quote card from the monthly download and the Reflections card with my thoughts for this month's prompt. I'll be back next week with my October & November prompts! Woohoo ~ it feels great to be caught up on this project... well I am until tomorrow when the December prompt comes out. LOL! Hello Friends! I have to say, I was very tempted to do several pages for last week because Week #47 was super jam packed with activities! The guys started out the week in Indianapolis and we all ended the Thanksgiving week in Philadelphia and New York City. Whew... lots of miles for sure! I used the Wander Edition Kit from the Project Life App for this page & thought it fit the busy week rather well. I'm sure I'll be using this kit to document more pages for this trip in the upcoming months. Another week over and that means that I have another page for my Project 52 album. This page features cards from the Project 52 ~ 2016 Edition. AE & Felicity Jane Page: Surprise! I'm not sure if you're more surprised by the fact that I'm posting twice in the same week, or that I actually had time to make a 12x12 physical scrapbook layout! LOL!!! It think this is the first 12x12 layout I've made since April or May and it felt great to get into my craft room again! Over the last few weeks, since marching band finished up, I've been working on finishing my son's sophomore year Band Album. 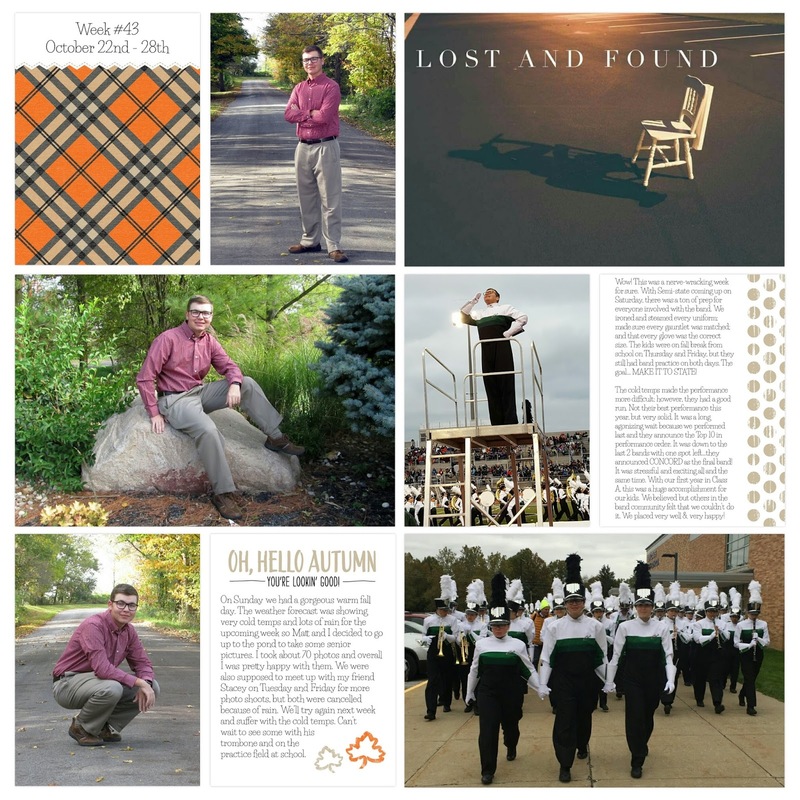 This is the final page of the school year when he was named Drum Major for his junior year. It was such an exciting night & Matt's reaction was awesome! I used the Felicity Jane Heidi & Caroline Kits for the pattern papers and embellishments. I love how their kits work so well together month after month. The big acrylic "Surprise" word is from the Ali Edwards Surprise Story Kit. For my page, I used the Coral Edition Kit from the Project Life App along with overlays from the Just Add Color Kit. 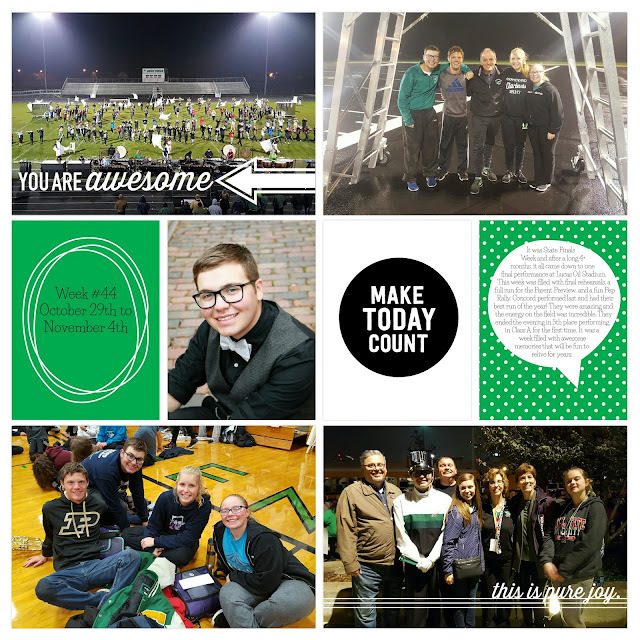 I know you aren't going to be surprised by another Marching Band page; however, this week I have a REALLY good excuse. Last Saturday was State Finals & the Concord Marching Minutemen made it! Our band has been in Class B for the last 30+ years and have made it to State Finals all but one year. 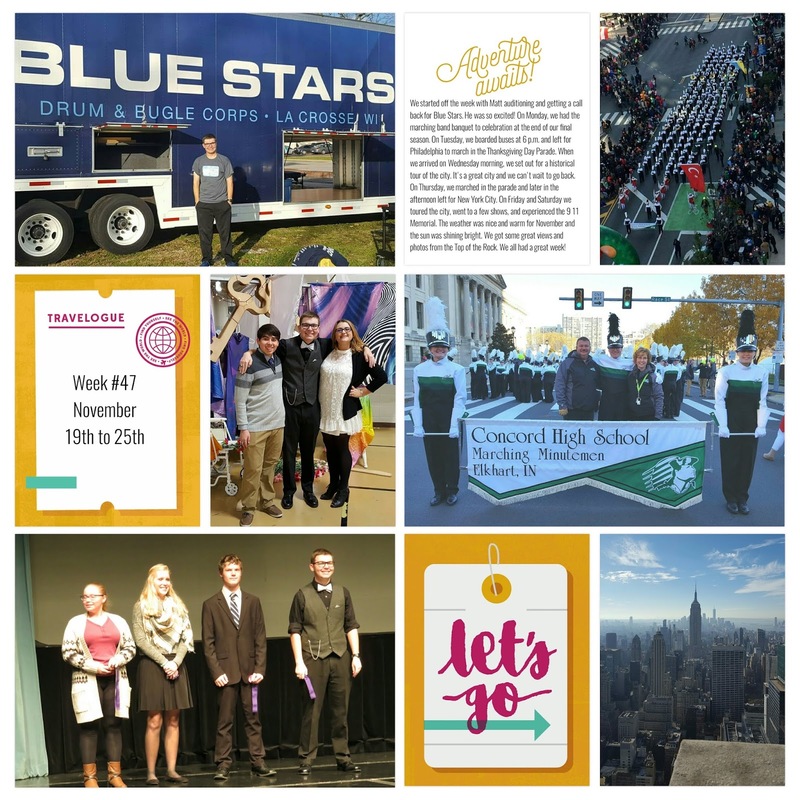 This year, it was our first year in Class A because our school population went up and many in the marching band community didn't think we would make it to finals! Well we did & we placed 5th!!! 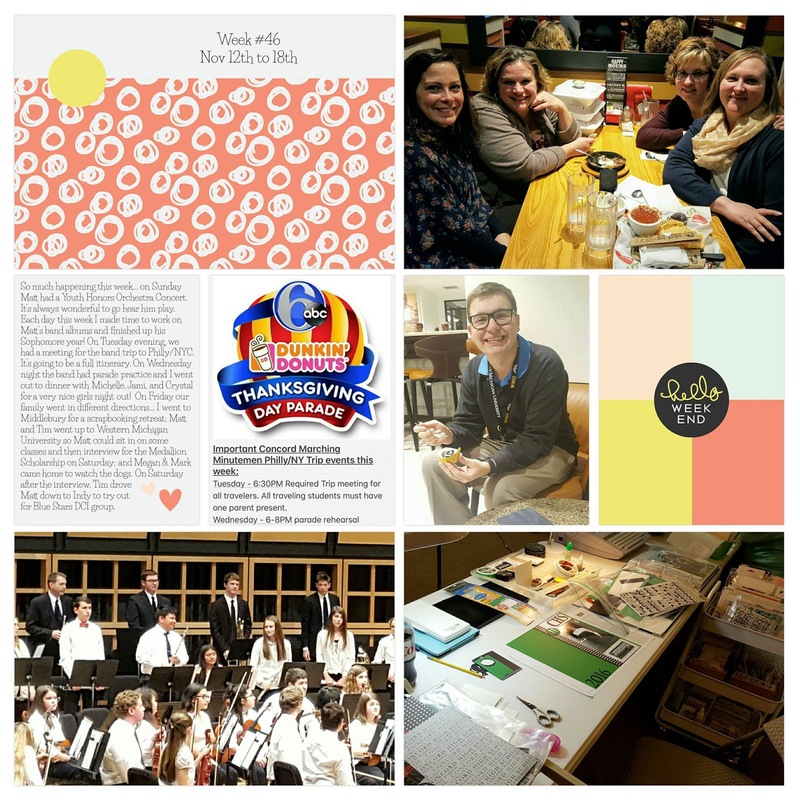 It was a very exciting week of activities and then Finals on Saturday! For my page, I used cards & overlays from the Confetti Edition Kits and I also added a few Just Add Color Overlays to the photos. Hello Friends!!! Thanks for hanging in there with me only posting Project Life App pages during this busy season of my life. I promise I'll have some physical pages posted soon! I thought I'd add a touch of fall this week on my pages so I used the Seasonal Snapshot 2015 Kit from the Project Life App with a few of Matt's senior pictures.